Last week, the Walker began screening three versions of the David Wojnarowicz film, A Fire in My Belly . These free screenings will be held in the Walker Lecture room at 11:30 am on days when the galleries are open, through the end of December. There will be an additional showing on Thursdays at 8:30 pm. There has been a lot in the press and online about the removal of A Fire in my Belly from Hide/Seek: Difference and Desire in American Portraiture at the National Portrait Gallery in Washington D.C. The Walker is joining many museums and galleries across the country in showing this film and defending artistic freedom (read the recent blog by Walker executive director Olga Viso). To put this work of art into context we are showing all three versions, including the official National Portrait Gallery version which was edited by curator Jonathan Katz and Bart Everly including audio from a 1989 ACT UP march in which David Wojnarowicz’ voice is audible. This will give our audiences a chance to see the work for themselves. Links to the film that can be found online are often to alternative versions, including one by Rosa Von Praunheim for a film called Silence=Death with a soundtrack by Diamanda Galas. 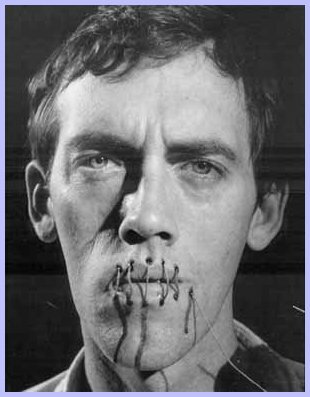 David Wojnarowicz (1954-1992) was a prominent artist in New York in the 1980’s working easily across media, including painting, drawing, printmaking, photography, film, and performance art. He called his work “fragmented mirrors of what I perceive to be the world.” This aptly describes his style of filmmaking which incorporated quick, rough montage and recurring images to create a poetic meditation on man, life, death, faith, and suffering. A Fire In My Belly was made in part as a response to the AIDS-related death of his close friend, artist Peter Hujar. [Hujar’s photographs are currently on view in the Walker’s Event Horizon exhibition]. In the original 13-minute silent film, Wojnarowicz juxtaposes black and white footage from the streets of Mexico including wrestlers in masks, legless beggars, a cockfight, and police officers on their beat with iconic images such as Day of the Dead votives, sugar skulls, tarot cards, and puppet skeletons. Integrated into the film are images from the making of Wojnarowicz’s Ant Series, a body of photographic work that portrays ants on a crucifix, Mexican coins, and Day of the Dead votive candles. Many of these images in the film are set in Mexican cemeteries which are usually lavishly adorned, particularly around Day of the Dead celebrations when people leave food for their deceased loved ones. While the images of the ants were staged by Wojnarowicz, similar images may have also easily been found in this setting, especially on the day after a Day of the Dead night vigil when religious icons fall to the ground and left over food offerings attract bugs to the site. After Wojnarowicz’s own untimely death from AIDS in 1992, a separate seven minute, silent, Super 8 version was found in his studio. All three versions of the film are being screened at Walker as a 24-minute program. Made in 1986-87, primarily in Mexico, and, notably, in the era when AIDS was being feared as an epidemic, the film explores ideas of struggle and death. As health care for AIDS in the US was being debated at that time with those opposing government funds to be used for treatment calling it a “gay disease,” travel to Mexico became a common path to find affordable medical care.